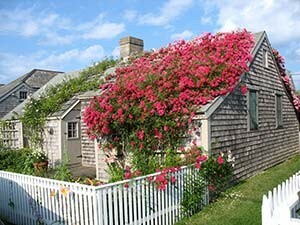 This historic Main Street, ‘Sconset cottage is one of many featured on the popular NPT ‘Sconset Tour. NPT’s classic tour provides an overview of Nantucket in its heyday and focuses on the portion of Main Street between the Pacific National Bank and the Civil War Monument. Learn about the street’s development and the area’s early residents and architectural styles, as well as how the houses have come to symbolize the island’s whaling era. Participants in the 75 minute tour will receive a copy of the NPT’s highly acclaimed history, A Walk Down Main Street. A Walk Down Main Street is offered second and third Wednesdays at 10:00am June through September. Tours at free in June, $10 other months. Private tours are available. Please call the office (508-228-1387) to schedule your tour today. Join NPT Executive Director Michael May, who shares his knowledge of this unique fishing settlement at the eastern edge of the island. The 75 minute tour focuses on the early “whalehouses” as well as the village’s boom as a seaside resort and actors colony at the end of the 1800s. This is a special tour offered the second and fourth Fridays June – mid September for $10 per person. Meet at ‘Sconset Trust at 4:00pm. *Private tours are available for a minimum of $250 please call 508-228-1387 for more details.